Perennial herb from a deep, scaly, egg-shaped bulb 3-5 cm long; flowering stems 20-70 cm tall, smooth. Basal leaves several, linear and grass-like, 10-40 cm long, 2-6 (10) mm wide, smooth, keeled, finely rough-margined; stem leaves 2 to 4, reduced upward becoming bract-like. Inflorescence a fairly compact to elongate, terminal cluster of several to many, stalked flowers, the stalks 0.5-3 cm long, ascending to erect; flowers creamy-white, bell- to saucer-shaped, of 6 distinct tepals, the tepals narrowly egg-shaped, 4-5 mm long, the inner 3 slightly longer than the outer 3, each with a yellowish-green, somewhat indistinct gland near the base just above the claw; stamens 6; pistil 1, 3-chambered. Capsules, oblong-elliptic, 3-lobed, 0.8-1.5 cm long; seeds numerous, brown, 5-6 mm long. Dry to mesic grassy or rocky slopes, meadows, forest edges and open forests in the lowland to subalpine zones; common in S BC south of 52degreeN (var. venenosus - predominantly along the coast, var. gramineus - more common in the interior); var. 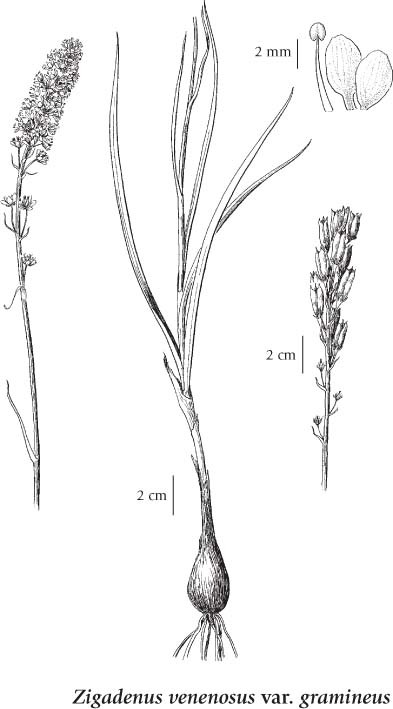 gramineus - E to SW SK and S to NE, NM, UT, ID and OR; var. venenosus - E to AB and S to UT, NV, CA and N Baja CA. 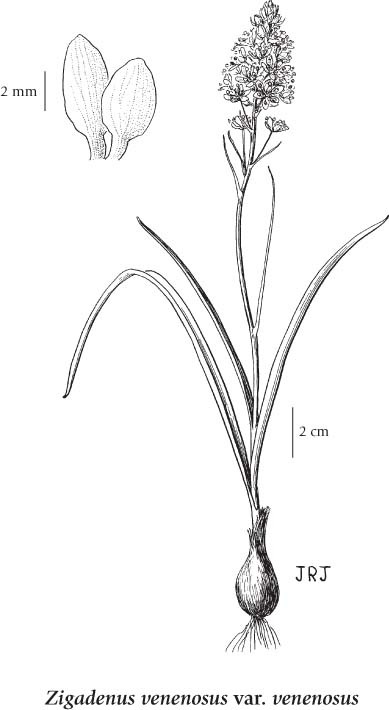 A shade-intolerant, submontane to subalpine, Western North American herb distributed equally in the Pacific and Cordilleran regions. Occurs on very dry to moderately dry, nutrient-medium soils within temperate, cool semiarid, and mesothermal climates; its occurrence decreases with increasing elevation and precipitation and increases with temperature. Common in grassy communities on very shallow, often melanized soils on rock outcrops. Characteristic of moisture-deficient sites.